** FREE POSTAGE within Australia, postage overseas at cost -- Note: Postage will be added automatically when you place an order, but I will adjust the postage cost when the order is processed. ** No era in the history of military dress has produced more illustrative material than that from 1792 to 1815. Any student of this period will be familiar with the works of most of the contemporary and nineteenth century artists who chronicled the myriad of uniforms and their variations and it seems that a new publication on the subject appears several times a month. As the main protagonist of those wars that bore their leader’s name for fourteen of them, France still generates more interest in its uniforms than any other country. Among the first of the post-Napoleonic artists was Alfred de Marbot (1812-1865) who produced a vast body of work on the armies of France. 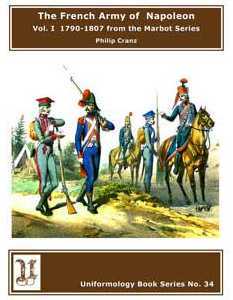 His collection of resources was apparently enormous and he was able to illustrate not only the standard uniforms of the infantry and cavalry, but also those of short lived and unusual units such as Foot Hussars!! This volume deals with uniforms worn from just before the Imperial period to 1807. Included are the first uniforms of the National Guard and infantry uniforms worn until the notorious white uniforms adopted by very few regiments in 1806. 48 Pages - 22 Illustrations and 23 pages of text. This item was added to our catalog on Saturday 03 October, 2009.